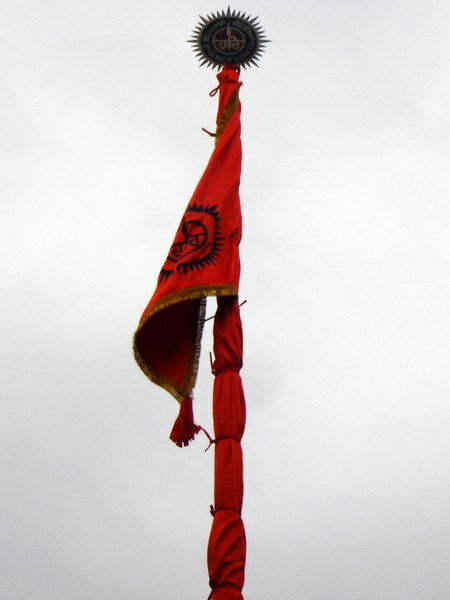 Ravidass ohnar sur (Soorma) kau saacha shetri jaan. Jih kul saaDh baisnou ho-ay. baran abran rank nahee eesur bimal baas jaanee-ai jag so-ay. ||1|| rahaa-o. Dhan so gaa-o Dhan so thaa-o Dhan puneet kutamb sabh lo-ay. Blessed is that village, and blessed is the place of his birth; blessed is his pure family, throughout all the worlds. Some unique personalities take birth in this wonderful world who become immortal through their great deeds in service of society. However true saints are beacon of enlightenment for entire humanity. Divisions based on country borders, colour, caste and creed are meaningless for them. Saints are like dense shade of banyan providing shelter and solace through cool westerly breeze against extreme heat generated by misdeeds of human beings. Sant Rama Nand Ji’s father Shri Mehnga Ram Ji and other ancestors, who were devotees of Dera Sachkhand Ballan, migrated from village Ballan during 1910-15 to settle down at village Alawalpur, district Jalandhar. Nature finds unique ways to create new historic events. Something similar happened in the lives of this family. Leading a normal married life, Shri Mehnga Ram Ji and Bibi Jeet Kaur Ji never thought that they would be blessed with a son who would unite the entire depressed community like beads of a rossary and play a marvelous role in bringing all round glory to a place of worship Dera Sachkhand Ballan known to the whole world which future generations shall always be really proud of. 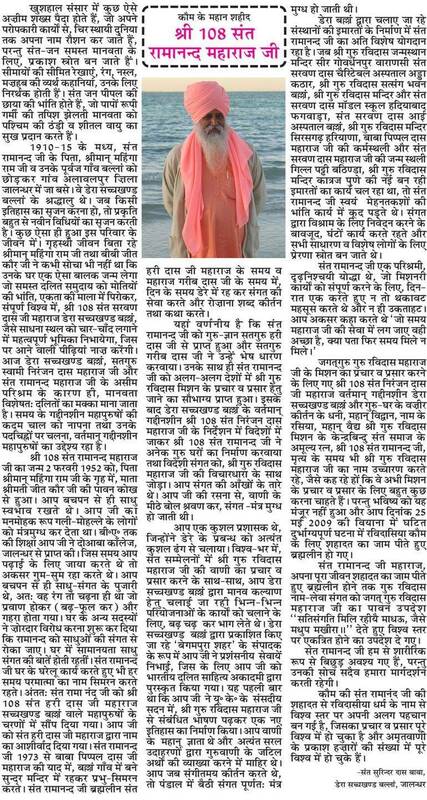 Because of untiring efforts of Sat Guru Swami Niranjan Dass Ji and Sant Rama Nand Ji, now Dera Sachkhand Ballan is known as Mecca for all humanity and especially for dalits. It has always been the motto of present spiritual leaders to understand and appreciated the great legacy of past spiritual leaders and move forwards on the foot prints left by them. Shri 108 Sant Rama Nand Ji was born on February 2, 1952 in the house of blessed parents Shri Mehnga Ram Ji and Shrimati Jeet Kaur Ji. He was of saintly nature from the very birth. His charming looks created a captivating spell on the people of the locality. He completed his graduation from Doaba College, Jalandhar. He invariably used to be in deep thoughts as a student. He liked company of saints from his childhood which had to lead him to divine enlightenment because of his devotion. Some members of the family started strong opposition demanding that Rama Nand should be kept away from the company of saints. There were frequent religious discourse in the house. Sant Rama Nand Ji used to pray to God every moment in meditation even while carrying out domestic work. Ultimately, Rama Nand Ji was at service of the sacred feet of Shri 108 Sant Hari Dass Ji, Dera Sachkhand, Ballan. He was blessed with ‘Naamdaan’ by Shri 108 Sant Hari Dass Ji. Sant Rama Nand Ji continued meditation of God while staying in the beautiful temple built in memory of Baba Pipal Dass Ji at village Ballan from 1973 onwards. Sant Rama Nand Ji remained in service of the devotees and conducted religious discourses singing devotional hymns daily during the life times of Brahamlin Shri 108 Sant Hari Dass Ji and Shri 108 Sant Garib Dass Ji. It is worth elaboration here that Sant Rama Nand Ji received ‘Naamdaan’ from Shri 108 Sant Hari Dass Ji and he was initiated as a saint by Shri 108 Sant Garib Dass Ji. He also had the good fortune of travelling with the latter to several countries for preaching and spread of teaching of Shri Guru Ravidass Ji. Latter he visited several countries under the directions of present spiritual head Shri 108 Sant Niranjan Dass Ji and helped construction of many temples and linking devotees in foreign countries with the preaching of Shri Guru Ravidass Ji. He endeared himself amongst all foreign devotees. Devotees were left spell bound after listening to the sweet melodies of his spiritual discourses. He was an able administrator who managed the affairs of Dera in an elegant manner. While preaching and spreading the teachings of Shri Guru Ravidass Ji through congregation of saints throughout the world, he always played leading role in carrying out the various tasks in the service of humanity under many charitable projects run by Dera Sachkhand Ballan. He provided praise-worthy services as Editor of ‘Begampura Shaher’ published by Dera Sachkhand Ballan for which he was honored by Dalit Literary Academy with a prestigious award. It was for the first time when he created history delivering his speech about Shri Guru Ravidass Ji at the House of Commons in United Kingdom. He was a great scholar of Gurbani and expert in explaining complicated details of same through extremely simple examples. Whenever he rendered hymns accompanied by spiritual music, all devotees present at the site remained spell bound. Not only he established Shri Guru Ravidass Sangeet Academy at Dera Sachkhand Ballan but his visionary instincts could identified many talented missionary singers, poets and writers who were honored with gold medals. Jalandhar Doordarshan telecasts programmes named “Amritbani Shri Guru Ravidass Ji” and “Begampura Shahar Ka Nao” rendered in his captivating voice. Shri Guru Ravidass Janam Asthan Mandir, Seer Goverdhanpur, Varanasi. Sant Sarwan Dass Charitable Hospital, Adda Kathar. Shri Guru Ravidass Satsang Bhawan, Ballan. Shri Guru Ravidass Mandir Hadiabad, Phagwara. Sant Sarwan Dasss Model High School Hadiabad, Phagwara. Sant Sarwan Dass Charitable Eye Hospital, Ballan. Shri Guru Ravidass Mandir, Sirgarh, Haryana. Karambhumi of Baba Pipal Dass Ji and birth place of Sant Sarwan Dass Ji, Gill Patti, Bathinda. Shri Guru Ravidass Mandir, Katraj, Pune. Sant Rama Nand Ji was an untiring and determined warrior who worked day and night to accomplish the missionary tasks without ever feeling tired or upset. He often used to say “Whatever time one can devote in service of Maharaj Ji, only that is useful, how does one know whether any opportunity will be available again or not”. Sant Rama Nand Ji embraced martyrdom while relentlessly spreading the preaching of Jagatguru Ravidass Ji Maharaj “Satsangat Mil Rahiye Madho Jaise Madhup Makhira” (O God! 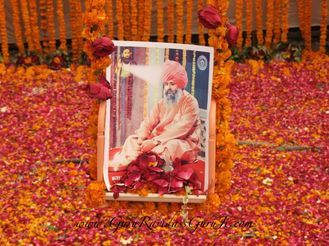 bless us to remain united in prayers like honey bees) advising till his departure for his heavenly abode, the followers of Shri Guru Ravidass Ji to stay always united at the world level. Sant Rama Nand Ji is no more physically with us because of most unfortunate incidence at Vienna, Austria, but his noble thoughts shall always be with us to lead us on the right path.